I have connected my arduino according to the schematics in the image, with a few additions. A DC motor (water pump) drawing power from Vin, going to ground via a transistor based in A0 analog output. Between the transistor and A0 is a 270 ohm resistor. In parallel to the motors poles is a diode, for protection. A Potentiometer connected to A1, 3,3V and GND. Code description: Using the Timer and the LiquidCrystal_I2C library, Once every other second the LCD is refreshed Once every day the water pump is started with an analogWrite(A0, HIGH) and it runs for 1-60 seconds based on the potentiometer setting. It seems the output of A0 does not deliver enough voltage to trigger the pump. This is a new error, before I got the screen, it ran the pump fine. Can anyone of you please give me some pointers in the right direction, to help me to determine the error in question? What should I try? If this question is not relevant or poorly written, please let me know, I'll try to clarify (or delete it). The analog pins are for analog input not output. You can only use them for digital output. analogWrite() can only be used on PWM capable pins (the ones marked with ~). On any other pin it sets the pin HIGH if the analog value > 127 and LOW if the analog value <= 127. Since you are writing HIGH, which is equal to 1, the output is LOW because 1 < 127.
why analogWrite? analogWrite parameter values are 0 to 255 (or 1023) so analogWrite(pin, 1) is close to 0. Not the answer you're looking for? 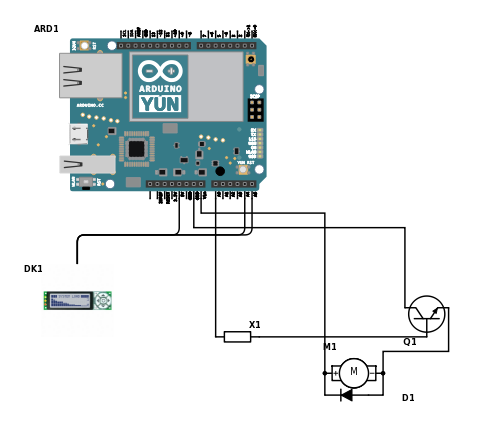 Browse other questions tagged arduino-uno lcd voltage-level hardware electronics or ask your own question. Controling pump while displaying moisture value on a LCD at the same time with soil moisture sensor? My brand new LCD screen doesn't display anything, even though there is no code errors?